I love one piece but i'm being forced to watch it by means of illegal streaming even though i pay monthly for a crunchyroll premium account, whilst users in other regions get to enjoy it officially as both CruchyRoll & FunimationNow stream it there and refuse to stream it in the UK and Europe. What the show is all about and why should people watch it. One Piece is a Japanese manga series written and illustrated by Eiichiro Oda. It has been serialized in Weekly Shōnen Jump since August 4, 1997; the individual chapters are being published in tankōbon volumes by Shueisha, with the first released on December 24, 1997, and the 73rd volume released as of March 2014. 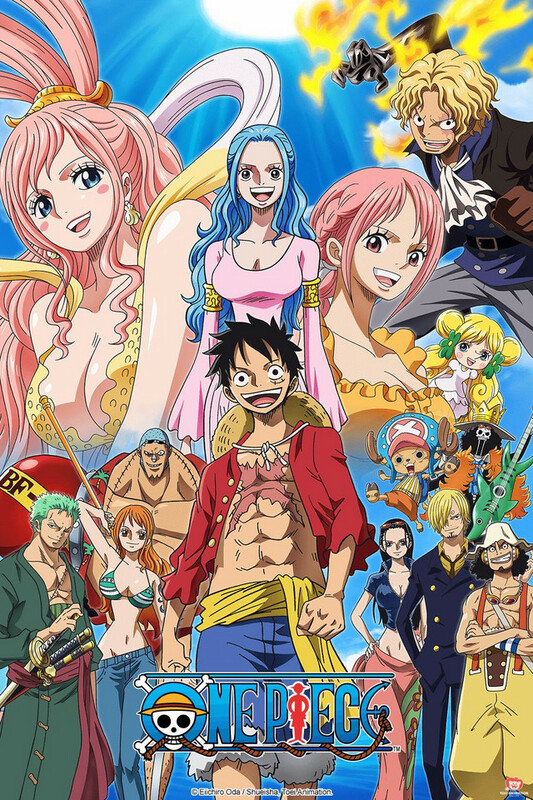 One Piece follows the adventures of Monkey D. Luffy, a young boy whose body gains the properties of rubber after unintentionally eating a Devil Fruit, and his diverse crew of pirates, named the Straw Hat Pirates. Luffy explores the ocean in search of the world's ultimate treasure known as One Piece in order to become the next Pirate King. The chapters have been adapted into an original video animation (OVA) produced by Production I.G in 1998, and an anime series produced by Toei Animation, which began broadcasting in Japan in 1999. Since then, the still ongoing series has aired over 600 episodes. Additionally, Toei has developed eleven animated feature films, an OVA, and five television specials. Several companies have developed various types of merchandising such as a trading card game, and a large number of video games. The manga series was licensed for an English language release in North America by Viz Media, in the United Kingdom by Gollancz Manga, and in Australia and New Zealand by Madman Entertainment. The anime series has been licensed by Funimation Entertainment for an English-language release in North America, although the series was originally licensed and distributed by 4Kids Entertainment. One Piece has received wide critical acclaim, primarily for its art, characterization, humor and story. Several volumes of the manga have broken publishing records, including highest initial print run of any book in Japan and the first book to sell over three million copies in Oricon history. As of 2013, the series had over 345 million volumes in circulation worldwide, making it the best-selling manga series in history. It's Here! Crunchyroll doing it Right! Crunchyroll getting One Piece finally convinced me to get an account! I did not grow up with anime and just recently got into it in the past year. Needless to say, One Piece is one of the best anime i've seen. It has the most intricate plot of all the anime i've seen and is still ongoing, great characters, hilarious, and offers the greatest combination of different genres in one show with great balance. A definite must see for anyone who loves shonen, comedy or adventure! This anime is just amazing. Don't judge it by it's cover or 650+ episode count cause it is amazing in every way. You will keep watching. And catch up sooner than you expect, too. The art's unique, and characters are all so likeable, you can't hate them. There aren't any that are too annoying or anything, like other animes, but just amazing characters. It's not just pirates going ARRR STEALING YOUR TREASURE but actually shows people who just want to explore the world, and the strawhats actually don't do too many bad things compared to how many good things they've done for others, while still as pirates being chased down by marines, when really it's the world government who do wrong, and terrible things. Just watch this, its filled with great characters, great story and will hit you in the feels. Unlike Naruto it isnt filled with bs fillers and the filler arent that bad. Just give it a try if you dont like it after East Blue maybe give it up? To be honest before i came to one piece i was a Naruto fanboy lol. and everytime someone mentioned one piece i will always put them down by saying stuff like luffy is crap or one piece is shxt. But then after watching this anime i regretted saying those words lol. One piece isnt just an anime its a journey you experience with the crew. I dont think i could ever have any other anime as my #1 besides this.